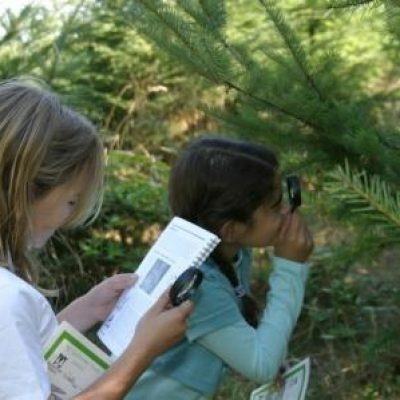 The Oregon Garden Natural Resources Education Program (OGNREP) provides 4th-6th grade students an opportunity to discover the importance of Oregon’s natural resources and learn about forests, wetlands and wildlife in our area. The Oregon Forest Resources Institute and Oregon Garden Foundation have partnered to bring this educational opportunity to Oregon school children. Our goal is to help students understand how natural resources contribute to our quality of life by utilizing our wetland habitat and the Rediscovery Forest – both amazing, hands-on places for learning. The funds supporting the OGNREP cover the cost of the program, school bus transportation, admission and program fees. Field trips and requested funds are awarded on a first-come, first-served basis, and an online program request form is required. Program is partially funded by the Oregon Forest Resources Institute and Oregon Garden Foundation. The funding enables the Oregon Garden Natural Resource Education Program to offer engaging educators and take home supplies for the students. Transportation reimbursement is available; an online program request form must be submitted. The Oregon Garden Natural Resources Education Program is open to the public and reserved on a first come, first served basis. Most groups arrange their field trip several months in advance, and spring is our busiest season. To enhance the experience, programs are limited to three classrooms per day. The Oregon Garden contains many trails to explore, many of them ADA accessible. We also have several restroom facilities, drinking fountains and a covered area. All programs occur rain or shine. The program typically takes four hours to complete; this includes a half hour for lunch. Hands-on, science based lessons average 60-90 minutes long. Program time is flexible based on travel schedules. The sessions may cover two or three of the topics listed below. Visits may take place throughout the school year, however, winter months are not highly recommended. We have a classroom or covered picnic area available, your students should bring a bagged lunch for full day programs. We request a minimum of one chaperone for every five students. Students must be accompanied by adults at all times. Participants must submit a program request form. Registration is only available online. After a review of your application, participants will be contacted with details of their trip. All participants receive an electronic packet with a confirmation letter and additional information. Please notify staff of any special requirements your group may have. The grade ranges listed with each lessons below are suggestion based on previous experience. If a lesson sounds suited to your needs but is out of your grade range, just let us know. We frequently add of adjust lessons to meet individual classroom needs. If your group has a topic that you would like to cover but do not see it listed, we may be able to accommodate the request. The education staff has experience and knowledge in natural resources and environmental education; they reserve the right to modify lessons based on availability and appropriateness. Wildlife Habitat 4-6 Using interactive science lessons, students learn about the relationships between plants, herbivores, carnivores and decomposers in different habitats. Use track molds, animal signs, and other visual aids to identify signs of wildlife and then venture into the Rediscovery Forest to find the real thing. Food Webs in Ecosystems 4-6 Identify and model a food web in the forest ecosystems. Use science inquiry to observe and collect data about decomposers, consumers, and producers in different forest types. Plant and Animal Adaptation 4-6 Really investigate plants by looking at their structure. Complete a scavenger hunt based on the plants adaptations. Students examine a variety of “seed” packages” and their strategies for seed dispersal. Students hone their observation and analytic skills while observing and discussing the structural and behavioral characteristics of tadpoles. Healthy Forest 4-6 Students will learn about the benefits of forests. How they provide clean air, water, shade, habitat and forest products. They will learn what trees need to survive and why some forests are managed. They will use hands-on forestry tools used by foresters every day, while discovering jobs that the forest sector has to offer. Service Learning Opportunities 4-12 Combine your learning experience with work projects such as pruning, planting trees, noxious weed control and other forest related activities. (Opportunities vary according to grade level and season). Contact Rikki Heath, heath@ofri.org, 503-799-4792, if you have any questions about programs or content. We have many accompanying publications available at www.oregonforests.org. As always, students learn best with advance classroom preparation of subject and vocabulary, we can provide pre- or post-lessons if requested.